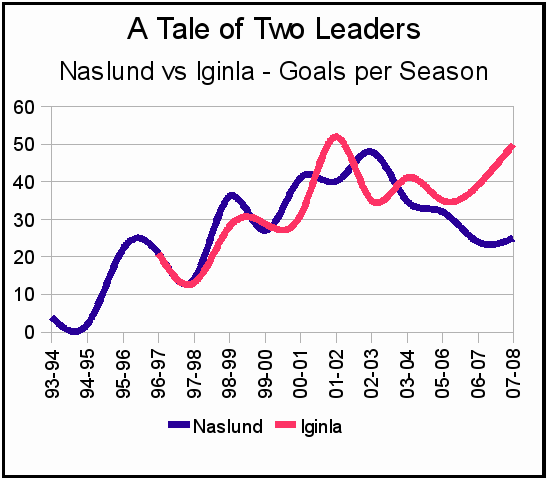 Goal Scoring: As you can see, Naslund and Iginla had a series of remarkably similar years, until the 2005 – 2006 season, after which Iginla started to pull away. 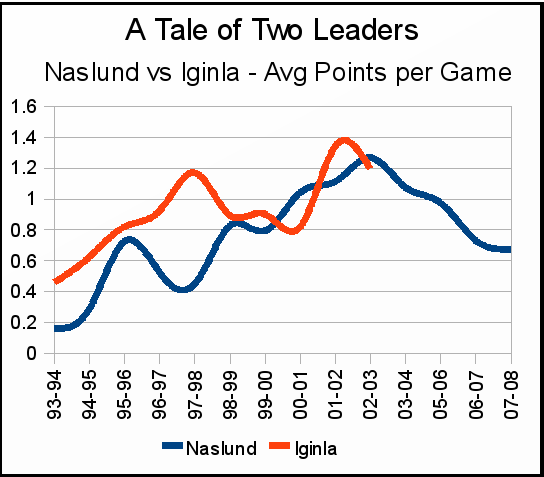 Again, very similar numbers, then Iginla pulls away, doubling Naslund’s production with a rock-solid 0.6 Goals per Game in the ’07-’08 season. 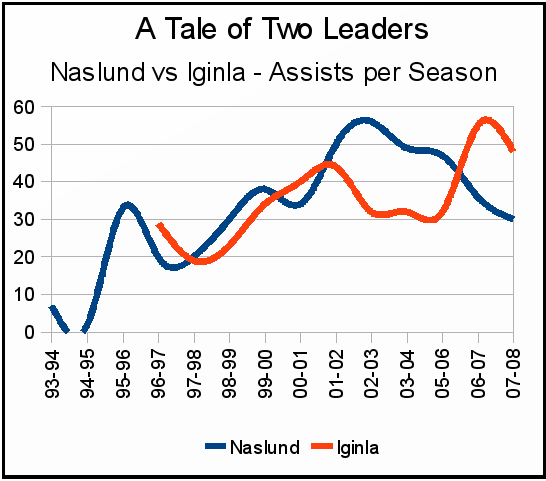 Naslund had some great years between the 2001 – 2002 season and the 2005 – 2006 season. Think Todd Bertuzzi and a healthy Brendan Morrison might have had a little something to do with that? The easy conclusion to reach? 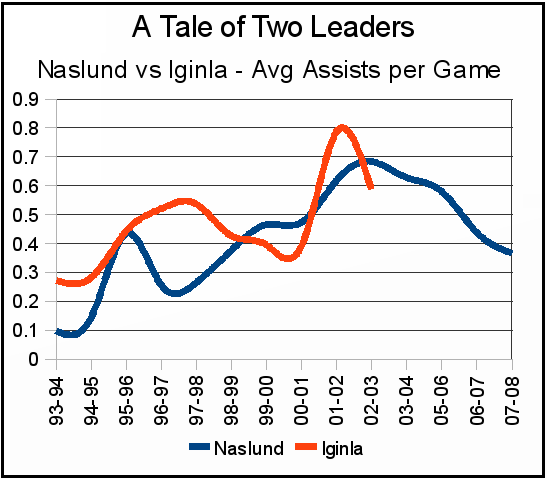 Markus Naslund’s best days are far behind him, while Jerome Iginla continues to improve, posting his best year to date. But does that tell the whole story? What about that most key of key factors: age? 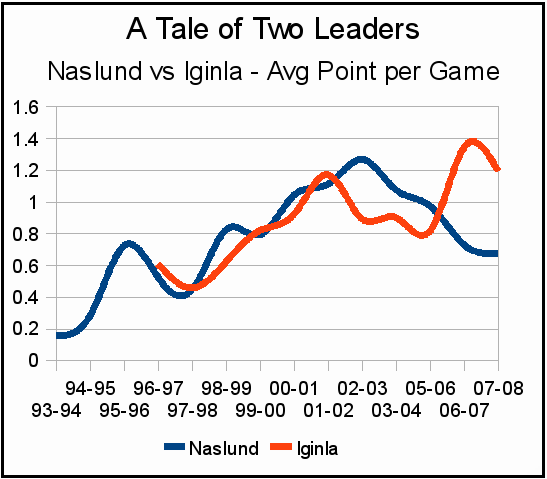 Let’s have a look at those same charts adjusted for the four year age difference by pulling Iginla’s stats back four years. Where does that leave the comparison of the two Captains? 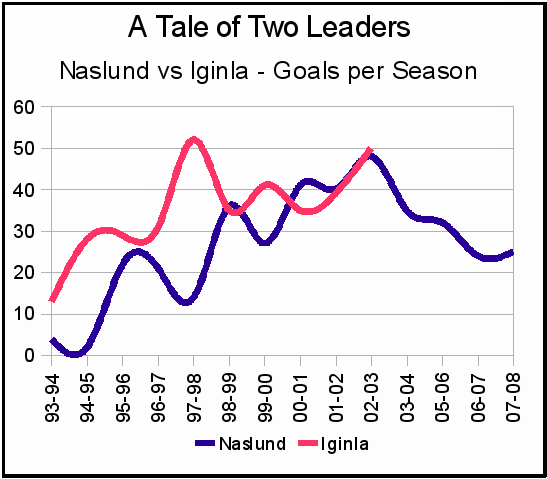 Iginla and Naslund have charted very similar goal-scoring paths when you compare them at the same age – even the shape of the curves is very similar. 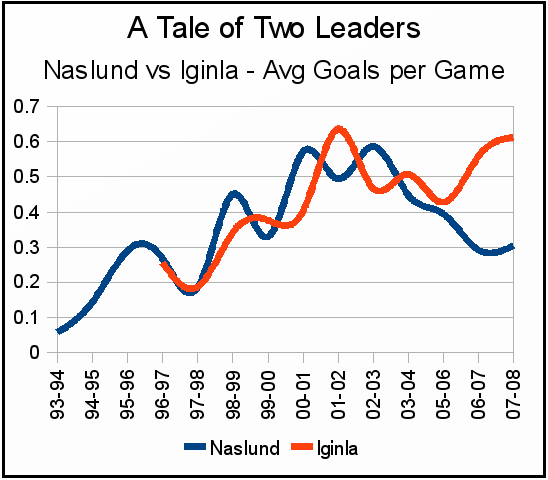 Again we see broadly similar shapes to the curves, although Naslund’s rise in production didn’t feature the huge breakout year Iginla had in ’97-’98. 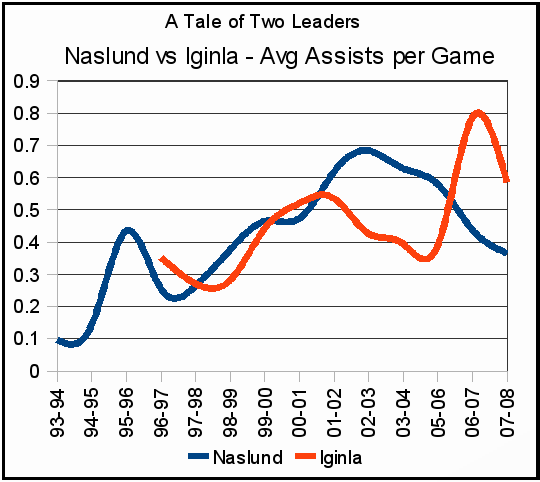 It’s the same story for Assists per Season. 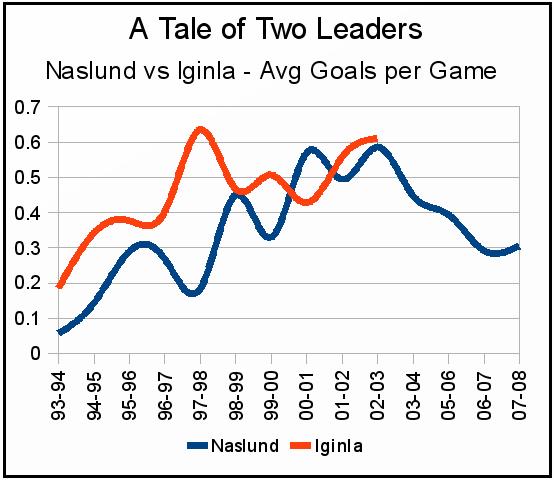 Note the downward trend as the players hit 30. We can see both players peaking at the 29/30 year-old mark. So what is the correct conclusion to draw? 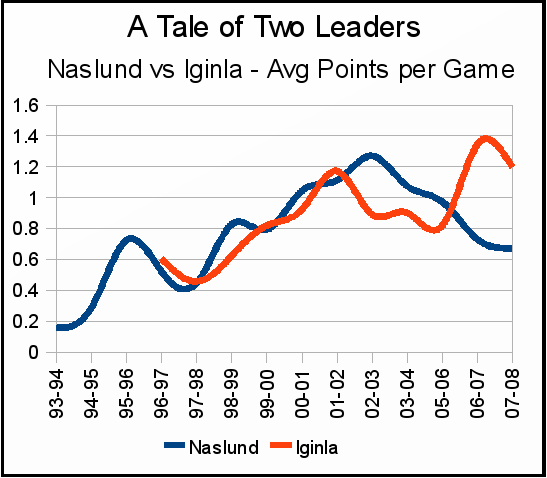 Well, Naslund is quite clearly in decline, on every measure, and has been for some time: his best days are over. 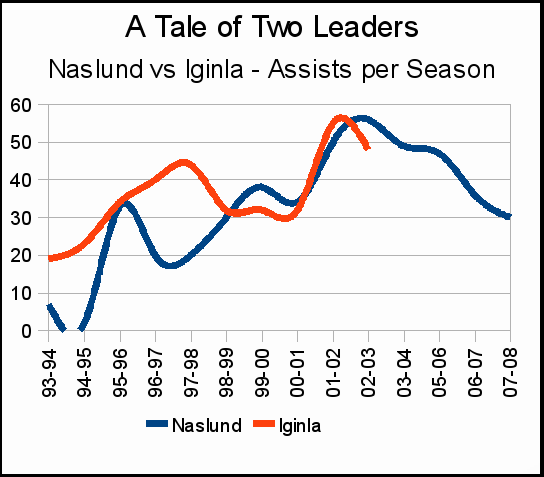 iginla, on the other hand, and despite his career-best season, may very well have just crested his peak. There’s no questioning the intensity and desire of Jerome Iginla – that’s a given, night in and night out – however for all his fight, there’s one opponent he just won’t be able to beat: time. And it just might be worth it for the Calgary Flames’ management team to keep that in mind when it comes to the next contract negotiations if they want to avoid paying nearly a quarter of a million dollars per goal, as the Vancouver Canucks did this seaons with Naslund.